Tracing the ups and downs of Felicia Hardy and Peter Parker. We all have those friends who date, break up, become good friends, date again, grow to hate each other, become good friends again and repeat over and over again. For the Marvel Universe, those friends go by the names Black Cat and Spider-Man. With the duo back in each other’s good graces in AMAZING SPIDER-MAN #16.HU, Marvel.com thought it might be a good idea to remind ourselves of everything they went through to get to this point. Flirt, Fake Your Death, Repeat. As You Do. 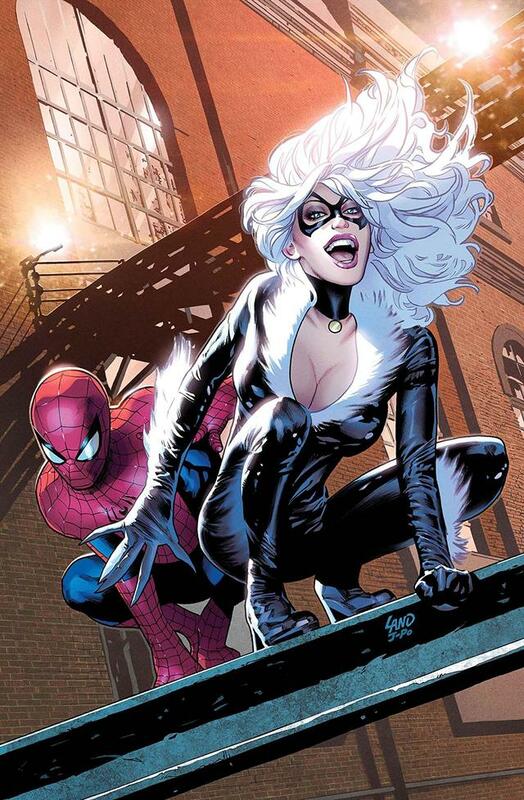 Felicia Hardy and Peter Parker first encountered one another in their costumed identities when Hardy had her mind set on busting her father out of prison. The plan went awry and Mr. Hardy died. Black Cat decided to fake her demise as well but not before the crush bug gave her a bite and she caught an infatuation for a certain Wallcrawler. She decided to come out of hiding and immediately let the Webhead know that she was interested in him. While Spidey didn’t return the feelings at first, he sensed good in her and decided to dedicate himself to getting her on the straight and narrow. In time, that led to her helping him against the Maggia. As a result, she received amnesty for past crimes. Curiously, she celebrated by faking her death yet again. Rumor spread through the criminal underworld that Kingpin had wired New York City to blow and only one device could set off the charges. While several villains set their sights on getting the detonator, Doctor Octopus came out of top. He, however, had no interest in using the device to get money or fame. Instead, he planned to just blow up the entirety of New York City, no warning given. Black Cat chose this moment to emerge from her second fake death and help Spidey. She stole the device successfully, averting the crisis. Doc Ock, however, did not take kindly to being trifled with. He repaid her theft in blood, seizing her with his arms while she was repeatedly shot by his underlings. Spidey arrived in time to rush her to the hospital and while the emergency room fought to save her life, Parker realized he loved her. While she survived and began an increasingly close partnership with Spider-Man, the incident left Felicia shaken. In desperation, she reached out to the Kingpin and went through a process to get super powers of her own. She immediately felt guilty about her new bad luck powers, however, and hid them and Kingpin’s role in them from Peter. Alas, the secret drove a wedge between them, and while Spidey could not figure out what had gone wrong, he could tell something had. Feeling the gulf between them had grown too large, he broke up with her. Despite the end of their relationship, it appeared that Black Cat had developed some sense of justice. She started stealing again, but no longer did so for herself. Instead, she fancied herself a kind of modern Robin Hood, redistributing the wealth to achieve a more equitable society. It only got easier for her when Spider-Man, still marked by the hex of Cat’s powers, went to Doctor Strange for help. The Sorcerer Supreme lifted the curse and that set off a chain reaction. As she had caused the hex in the first place, the lifting of it altered her abilities as well. The lack of predictability of the bad luck powers departed, and in their place Hardy received retractable claws as well as increased agility, balance, strength, and vision. Despite her new abilities, however, Black Cat still found herself staring down the barrel of the Foreigner’s gun. Only Spider-Man’s timely intervention saved her life. That intervention also rekindled their romance. Except Felicia’s feelings turned out to be a lie. Foreigner had recruited her as a tool to destroy Spidey, and everything since then had been part of a carefully orchestrated plan. In the end, Black Cat turned double agent and betrayed her handler, but the damage had been done. Rather than face up to what she nearly did, Hardy instead escaped to France. What Are We, in High School? By the time Black Cat worked her way back to American shores, Peter Parker has more than moved on. In fact, he has married Mary Jane Watson. Rather than move on with her own life, Felicia instead felt that the man she nearly betrayed should have remained single while she worked on herself abroad. She then figured she would be justified in a harassment campaign against the newlyweds. The features of her plan included dating Peter’s high school bully-turned-buddy Flash Thompson. Despite her behavior, somehow she and Peter found a way to reconcile. Not only that, she and Mary Jane sparked a friendship too. On top of that, she realized she really did care for Flash; cared for him so much she asked him to marry her. Thompson, however, said no, although his rejection seemed to indicate he really did love her but could not continue with her knowing why their relationship had begun. When Peter Parker revealed himself to be the one and only Friendly Neighborhood Spider-Man live on television, Felicia Hardy could not help but take it personally. As one of the first people he ever revealed his identity and still one of the few who knew it, she had felt special, as though he trusted her in a way he trusted few others. However, if he could tell the world, well, maybe their friendship had not been as special as she assumed. It would take years for Spidey to address this. While Mephisto’s magical retcon of his public identity “erased” that particular “violation” of his bond with Hardy, she never stopped feeling the absence of their supposed bond. Finally, a few months ago, he listened to her, truly, for the first time. After hearing her explain the gap it left in her life, he removed his mask in front of her. This reaffirmed their trust and reconnected Black Cat to her erased memories. In between Mephisto’s erasure of Peter’s marriage and unmasking of Spider-Man and Spidey “reminding” Black Cat once again of his true identity, things got complicated. First, the now single Spider-Man tumbled back into bed with Black Cat. The two would sleep together with their masks on or in the dark to maintain the secret identities. During this time, Hardy aided the Webslinger by stealing back Spider-Man’s blood from Mr. Negative, protecting Peter from a specialized virus that was engineered to kill him. While their physical relationship petered out (no pun intended), the two seemed to be on good terms. Imagine Felicia’s shock then, when she tried to say hi to Spider-Man and he punched her in the face. Readers knew that Otto Octavius had seized control of Spidey’s body, but Hardy had no clue. Thus, after escaping from prison, she had a huge grudge on her shoulders. She fully threw herself back into a life of crime and repeatedly targeted the Webhead for head busting and, ideally, grievous bodily harm. It would not be until Maniac attempted to turn everyone to his will with the use of a symbiote that Spider-Man and Black Cat finally managed to bury the hatchet and get along. AMAZING SPIDER-MAN #16.HU, written by Nick Spencer with art by Iban Coello, goes on sale Wednesday, March 6. Pre-order your copy today online or at your local comic shop!